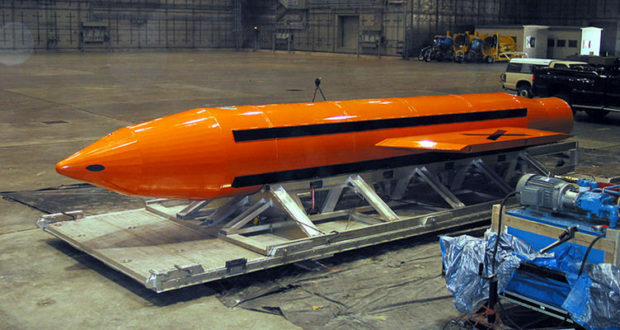 London – The dropping of a 21,600 pound bomb – the largest non-nuclear weapon – on Afghanistan by the United States is evidence that the Trump government is using Afghanistan as a live human experimental field for its weaponry. The bomb, which has a mile-long radius and is capable of massive devastation including obliteration, crushed internal organs, bleeding ears and loss of hearing, massive shockwaves, and huge environmental and infrastructure damage, was dropped on the orders of Army Gen. John Nicholson in Afghanistan. According to local reports, the bomb shook the entire district. There is not a single home without a broken window and shrapnel travelled as far as the district headquarters. A local villager said it “felt like doomsday”. Another added that he lost his livestock and described a panic with relatives checking on each other. * Up to 30 miles: 10,000 foot high mushroom cloud visible.